Applications: The Axicon Combi set is an all in one system comprising both the Axicon 6000 and the Axicon 7000 read heads aimed at verifying from the smallest to the largest linear barcodes used in general distribution of retail products (EAN-13, EAN-8, UPC-A and UPC-E, GS1 Databar, EAN-128 aka GS1-128, ITF-14, pallet labels). This easy to operate, plug and play system is perfect for product manufacturers, label printers, printers and packagers (cardboard, flexible, aluminium, corrugated cardboard, etc), pre press studios. Features & Benefits: ISO/ANSI verification standards & traditional verification, symbology auto-dscrimination, automatic variable aperture, scan saving & loading, static reflectance meter, display of X dimension/magnification. product look-up option. individual bar/space dimensional analysis. Hardware: Two read heads. Specifications, as per the Axicon 6000 and Axicon 7000 Series. System requirements: PC running Windows (95 or later), Apple Macintosh running Mac OSX version 10.2 or later, Axicon 9025 portable display unit. 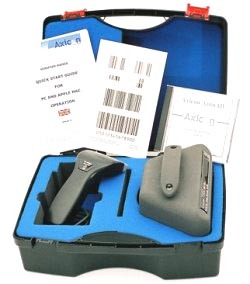 The verification system is delivered complete with: two read head (hardware), a CD with the Axicon verifier software (in several languages), a data cable, a quick start guide, a calibration card, compliance certificates, all in a protective carry case.